If you’ve been wanting to visit Cancun, or already have on numerous occasions like we have, you are probably scouring the internet for the best Cancun all-inclusive resort to stay at. There are so many to chose from, and they all have their highlights, but we prefer one brand of resorts in Cancun that rise above the rest – Palace Resorts. In Cancun, you’ll find many top notch Palace resorts and it’s hard to decide which one to choose. In this post, we’ll introduce you to the top 3 and tell you why and when to choose one over the other. By the end of this article, we’ll give you all the info you need to make a decision and book your Cancun vacation. These three resorts are a product of Palace Resorts and all of them offer a true luxury experience. They are: Le Blanc Spa Resort, an adults-only ultra all-inclusive resort; Sun Palace, an adults-only all-inclusive resort; and Moon Palace Golf & Spa Resort, a family-friendly all-inclusive resort, which includes The Grand at Moon Palace. If you’re looking for the perfect resort in Cancun for your vacation, you absolutely must check out these three all-inclusive resorts . You can choose an adults-only, couples-only or family-oriented resort, based on your personal preferences, and be assured that you’ll have an incredible experience no matter which one you choose. Of all the resorts in Cancun, Le Blanc Spa Resort is one of the very best. It is consistently rated a full 5 stars on Trip Advisor and receives awards of excellence for its design, service and dedication to excellence. Once you’ve experienced Le Blanc it will be hard to go back to any other resort. As the resort puts it, Le Blanc is “the transformation of all-inclusive into all-incredible”. One of the highlights of Le Blanc is its 29,000 sq ft spa, complete with 19 treatment rooms, hydrotherapy, couples treatment rooms and all the services you would expect from a world-class spa. Treatments can be booked in advance to save time and ensure you get what you want. Since this is one of the top resorts in Cancun, you can expect only the best from every aspect of this hotel. The resort is adults only and has a luxury feel through and through. You’ll even have your own private butler to attend to anything you might need during your stay. The beach is one of the best in Cancun and is always immaculate with white sand and beach palapas for relaxing. The accommodations at Le Blanc are ultra luxurious with all the amenities you’ll need. Each room comes with butler service, free wifi, a free minibar and liquor dispenser, Bvlgari bath amenities, pillow menu, 24-hour room service, and wine upon arrival. The resort has five gourmet restaurants and five bars, including two swim-up bars and a martini bar. Lumiere: Formal restaurant with French-fusion dishes. Has a seven-course tasting menu. Blancinternational: This restaurant highlights show cooking, breakfast and lunch buffet, dinner steakhouse & Mexican cuisine. The top activities at Le Blanc are pool and beach. The beach at Le Blanc is one of the best is Cancun. They have a full fitness center that offers pilates, spinning, and TRX suspension training. 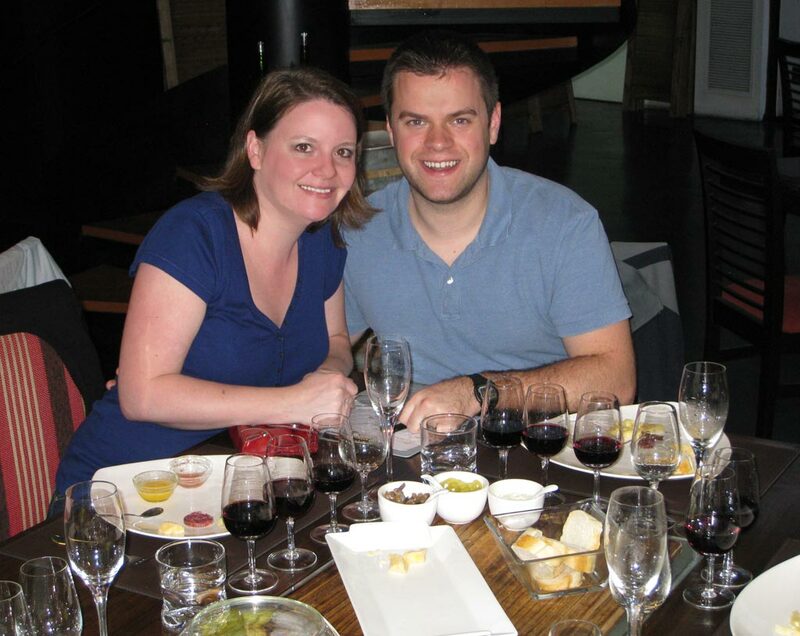 The daily schedule also includes fun activities like wine tasting and cooking demonstrations. If you’d like to explore outside the resort, you can set up excursions to the top spots around the area. The Sun Palace is and all-suites, adults-only resort perfect for couples looking for a little romance. If you’re looking for a resort for your honeymoon, Sun Palace is a good choice. And you certainly won’t be the only couple there celebrating their marriage. The resort has 252 suites with balconies and double-sized jacuzzis. It’s smaller than the other Palace Resorts to give it an intimate, boutique feel. It’s not a sprawling place that requires a golf cart to get around. The infinity pool is located right on the beach with a fantastic view and the beach is lovely with a long strip of pristine white sand. Don’t expect a party/nightlife scene at this resort. It’s a laid-back romantic vibe. However, it’s not so quiet and intimate that you won’t meet your fellow travelers over karaoke or pool games. Every room comes with a balcony, individually controlled air conditioning, Farouk chi bath amenities, free liquor dispenser and mini-bar. The concierge level includes extras like two 25-Minute massages at the spa, an exclusive beach bag, private beach lounge chair area with waiter service, a candlelight dinner and exclusive concierge service. As this is a more intimate resort, there are only 3 restaurants, but the variety is large. You can spend your meals focusing on each other while enjoying the food. There are also a number of bars to enjoy. The Steak: Casual dinner option. Buffet at lunch, seafood and steak at dinner. Aurora: International breakfast and lunch buffet, and an a la carte Mexican menu at dinner. Lobby bar, pool bar, wet bar, and snack bar. With the included resort credit, you can get out around the Quintana Roo area of Mexico and see the sites, like the Mayan Ruins and cenotes. On the resort, you can enjoy sunbathing, swim up bars and indoor hot tub. There’s also a full spa. If you want to get out and see the other resorts, you can enjoy the other Palace Resorts during your stay. Average cost: $550/nt for 2 people. ⇒ Read reviews of Sun Palace on Trip Advisor. Moon Palace Resort is the biggest of the Palace resorts. It consists of three hotels: Nizuc, Sunrise and the newest: The Grand. Each of these hotels has its own unique offering, so you’ll want to take a look at each to determine which is right for you. The entire Moon Palace resort has 3,274 rooms and is spread across 200 acres. It’s a great choice for families because it offers an array of styles and choices so everyone is happy. There’s a golf course designed by Jack Nicklaus with 27 holes, a huge number of pools and water sports, a state of the art spa and a great nightclub. The resort we’re including today is The Grand at Moon Palace. The Grand at Moon Palace features ten restaurants, seven bars, nine outdoor pools including an olympic-size pool, five swim-up bars, a fitness center, a beach club, a theater, a sports bar and bowling alley, play room for the kids, and a spa with 41 single treatment rooms, 21 double treatment rooms, two golden suites and hydrotherapy facilities. Your stay includes use of all the Palace resorts in Cancun, Cozumel and the Riviera Maya (except the Le Blanc Resort). The rooms at The Grand feature a king bed or two double beds, a double whirlpool tub, private bath with shower, balcony with chaise lounge, table and chairs, sitting area, free mini bar and liquor dispenser, plus a bottle of wine upon arrival. They have 24-hour room service, free wifi, a pillow menu and individually controlled air conditioning. At The Grand you can dine at a different restaurant every night. Between the three resorts at Moon Palace, there are over 25 restaurants and bars in a variety of different cuisines. They also have a show-cooking experience. Grand Buffet: Central Lobby; open for breakfast, lunch and dinner. Caribbean Restaurant: open for breakfast, lunch and dinner. Cielito Lindo – La Cantina: Mexican Cuisine. Open for breakfast and dinner. Los Tacos: Traditional tacos. Open for lunch and dinner. 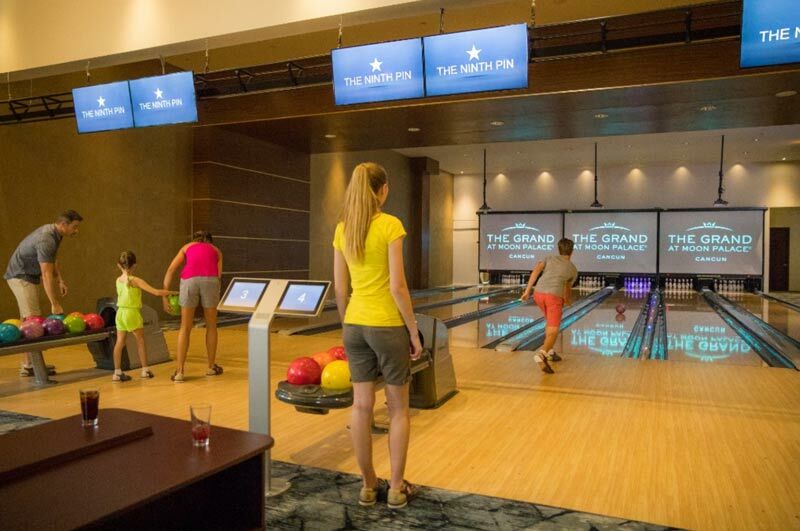 This is one of the only resorts in Cancun to have a bowling alley. They also have unlimited golf and an arcade room. The resort is family-friendly, but you can get away from it all at the adults only pool areas. They also offer a full gym. Nightly entertainment: Caribbean show, Latin show, Mexican night, fire show, karaoke, theme parties, contests, singers and live performances. Kids Club: Tennis lessons, mini-golf, Spanish lessons, treasure hunts, beach soccer, pinata-making, etc. We know you’ll have a fantastic time during your stay at these 3 top Palace Resorts in Cancun. I’ve stayed at a number of resorts in Cancun and the Palace Resorts always shine above the rest. The service, the drinks, the food, and the lovely rooms are all top notch. If you want to find a resort in the Mayan Riviera, south of Cancun, check out these three outstanding all-inclusive resorts. Have you been to a Palace Resort? Tell us about your experience. Like this post? Share it with friends on Pinterest! This entry was posted in Reviews and tagged Mexico.